What is Watson Famous For? James Watson is one of the most famous geneticists in the history of genetics, and is best known as the co-discoverer of the structure of DNA along with Francis Crick. He shared the Nobel Prize in Medicine in 1962 with Crick and Maurice Wilkins. He was born on April 06, 1928 in Chicago, Illinois. The soon to be world famous geneticist graduated with a BSc in Zoology in 1947 from the University of Chicago. Attracted by Salvador Luria’s work on genetic mutations, he went to Luria’s lab in Indiana University to do his PhD in 1948. 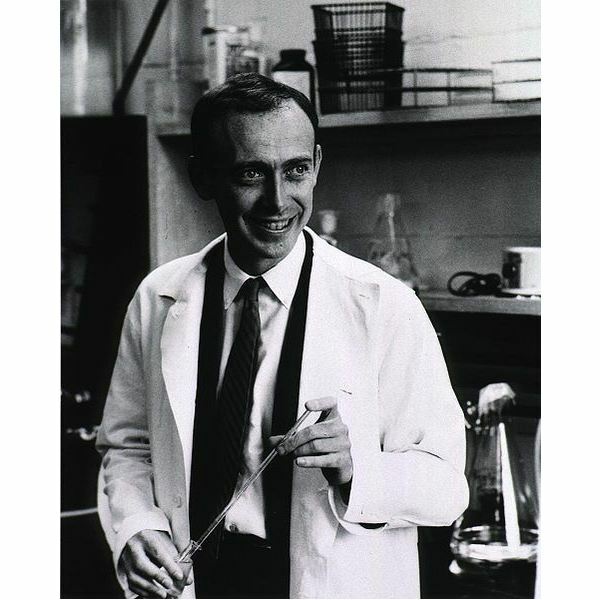 Then it was off to Copenhagen in 1950 to do his post-doctoral fellowship in the lab of Herman Kalckar, a biochemist. Watson met Crick in 1951 in the Cavendish Laboratory at Cambridge. They began corresponding with Maurice Wilkins about X-ray diffraction studies of DNA which showed that it had a helical structure. It is said that this data was given to Watson and Crick without the knowledge of Rosalind Franklin, the scientist who had actually acquired it. But they received help from other quarters also. Erwin Chagraff had discovered that the ratio of the bases Guanine to Cytosine as well as Adenine to Thymine always remained a constant. The accurate structure of the bases was discovered by Jerry Donahue. Watson and Crick put everything together and they discovered that DNA has a double helical structure with bases forming pairs with the opposite strand. Adenine always pairs with Thymine and Guanine pairs with Cytosine. The base pairs are held together by hydrogen bonds. Their findings were published in Nature on April 25, 1953. Watson became the chairman of the Human Genome Project in 1989 and remained so until 1992. He has been surrounded by controversies ever since his book ‘DNA: The Double Helix’ was published. Crick and Wilkins themselves had objected to many sections in the book. And he’s known for his combative approach in public debates. Throughout his career he won many awards and citations and in 2008 he was appointed Institute advisor at the Allen Institute for Brain Science. He goes down in history as one of the greatest scientists of our generation because of the landmark paper that kick started a revolution in biology and medicine.